Special articles from 1� Seminario Nacional de Monitoramento e estat�stica da Atividade Pesqueira. Mendon�a, J. T. & Miranda, L. V. Estat�stica pesqueira do litoral sul do estado de S�o Paulo: subs�dios para gest�o compartilhada. Pan-American Journal of Aquatic Sciences, 3(3): 152-173. Download PDF file (579 Kb). Catella, A. C., Mascarenhas, M. R., Albuquerque, S. P., Albuquerque, F. F. & Theodoro, E. R. M. Sistemas de estat�sticas pesqueiras no Pantanal, Brasil: aspectos t�cnicos e pol�ticos. Pan-American Journal of Aquatic Sciences, 3(3): 174-192. Download PDF file (620 Kb). Ruffino, M. L. Sistema integrado de estat�stica pesqueira para a Amaz�nia. Pan-American Journal of Aquatic Sciences, 3(3): 193-204. Download PDF file (426 Kb). Isaac, V. J., Santo, R. V. E. & Nunes, J. L. G. A estat�stica pesqueira no litoral do Par�: resultados divergentes. Pan-American Journal of Aquatic Sciences, 3(3): 205-213. Download PDF file (204 Kb). Costa e Silva, M., Pereira, P., Falc�o, M & Fonseca, L. C. Caracteriza��o das comunidades de anel�deos poliquetas ao longo de um gradiente de profundidade na regi�o do Anc�o (Algarve - Portugal). Pan-American Journal of Aquatic Sciences, 3(3): 214-231. Download PDF file (610 Kb). Segura, A. M., Delgado, E. A. & Carranza, A. La pesquer�a de langostino en Punta Del Diablo (Uruguay): un primer acercamiento. Pan-American Journal of Aquatic Sciences, 3(3): 232-236. Download PDF file (168 Kb). Gon�alves, A. A. & Ribeiro, J. L .D. Do phosphates improve the seafood quality? Reality and legislation. 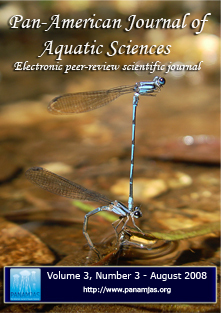 Pan-American Journal of Aquatic Sciences, 3(3): 237-247. Download PDF file (79 Kb). Gon�alves, A. A., Rech, B. T., Rodrigues, P. M. & Pucci, D. M. T. Quality evaluation of frozen seafood (Genypterus brasiliensis, Prionotus punctatus, Pleoticus muelleri and Perna perna) previously treated with phosphates. Pan-American Journal of Aquatic Sciences, 3(3): 248-258. Download PDF file (1,222 Kb). Ramos-Cruz, S. Estructura y par�metros poblacionales de Callinectes arcuatus Ordway, 1863 (Decapoda: Portunidae), en el sistema lagunar La Joya-Buenavista, Chiapas, M�xico. Julio a diciembre de 2001. Pan-American Journal of Aquatic Sciences, 3(3): 259-268. Download PDF file (670 Kb). Mai, M. G., Silva, T. A. S., Almeida, V. L. S. & Serafini, R. L. First record of the invasion of Dendrocephalus brasiliensis Pesta, 1921 (Crustacea: Anostraca: Thamnocephalidae) in S�o Paulo State, Brazil. Pan-American Journal of Aquatic Sciences, 3(3): 269-274. Download PDF file (296 Kb). Garc�a, C. B., Perez, D., Duarte, L. O. & Manjarres, L. Experimental results with a reducing device for juvenile fishes in a tropical shrimp fishery: impact on the invertebrate bycatch. Pan-American Journal of Aquatic Sciences, 3(3): 275-281. Download PDF file (78 Kb). Capap�, C., Reynaud, C., Vergne, Y. & Quignard, J. P. Biological observations on the smallspotted catshark Scyliorhinus canicula (Chondrichthyes: Scyliorhinidae) off the Languedocian coast (southern France, northern Mediterranean). Pan-American Journal of Aquatic Sciences, 3(3): 282-289. Download PDF file (303 Kb). Cardozo, A. P., Figueiredo, M. R. C., Gama, A. M. S. & Sampaio, J. A. O. Predation of Jenynsia multidentata (Jenyns) (Cyprinodontiformes, Anablepidae) on copepods in laboratory conditions. Pan-American Journal of Aquatic Sciences, 3(3): 290-293. Download PDF file (40 Kb). Duarte, M. S., Maia-Lima, F. A. & Molina, W. F. Interpopulational morphological analyses and fluctuating asymmetry in the brackish crab Cardisoma guanhumi Latreille (Decapoda, Gecarcinidae), on the Brazilian Northeast coastline. Pan-American Journal of Aquatic Sciences, 3(3): 294-303. Download PDF file (273 Kb). Fonseca, L. C., Cristo, M., Machado, M., Sala, J., Reis, J., Alcazar, R. & Beja, P. Mediterranean temporary ponds in Southern Portugal : key faunal groups as management tools?. Pan-American Journal of Aquatic Sciences, 3(3): 304-320. Download PDF file (734 Kb). Izzo, C. & Gillanders, B. M. Initial assessment of age, growth and reproductive parameters of the southern fiddler ray Trygonorrhina fasciata ( M�ller & Henle, 1841) from South Australia. Pan-American Journal of Aquatic Sciences, 3(3): 321-327. Download PDF file (243 Kb). Gianuca, D., Quintela, F. M., Barros, J. A., Gomes Jr., A. & Gianuca, N. M. Ocorr�ncia regular da gar�a-azul Egretta caerulea (Ciconiiformes, Ardeidae) no estu�rio da Lagoa dos Patos, Rio Grande do Sul, Brasil. Pan-American Journal of Aquatic Sciences, 3(3): 328-334. Download PDF file (300 Kb). Garc�a, C. B., Troncoso, W., S�nchez, S. & Perdomo, L. Contribution to vital statistics of a guppy Poecilia reticulata Peters (Pisces: Cyprinodontiformes: Poecillidae) pond population in Santa Marta, Col�mbia. Pan-American Journal of Aquatic Sciences, 3(3): 335-339. Download PDF file (117 Kb). Marafon-Almeida, A., Souza-Concei��o, J. M. & Pandolfo, P. S. V. Distribui��o e abund�ncia de larvas de tr�s esp�cies de Penae�deos (Decapoda) na plataforma continental interna adjacente � Ba�a da Babitonga, Sul do Brasil. Pan-American Journal of Aquatic Sciences, 3(3): 340-350. Download PDF file (202 Kb). Werneck, M. R., Thomazini, C. M., Mori, E. S., Gon�alves, V. T., Gallo, B. M. G. & Silva, R. J. Gastrointestinal helminth parasites of Loggerhead turtle Caretta caretta Linnaeus 1758 (Testudines, Cheloniidae) in Brazil. Pan-American Journal of Aquatic Sciences, 3(3): 351-354. Download PDF file (47 Kb). Capap�, C., Hemida, F., Quignard, J. P., Ben Amor, M. M. & Reynaud, C. Biological observations on a rare deep-sea shark, Dalatias licha (Chondrichthyes: Dalatiidae), off the Maghreb coast (south-western Mediterranean). Pan-American Journal of Aquatic Sciences, 3(3): 355-360. Download PDF file (235 Kb). Ram�rez-Luna, V., Navia, A. F. & Rubio, E. A. Feeding ecology of an estuarine fish assemblage of northern Pacific Coast of Ecuador. Pan-American Journal of Aquatic Sciences, 3(3): 361-372. Download PDF file (324 Kb). Hirose, G. L. & Negreiros-Fransozo, M. L. Population biology of Uca maracoani Leach (Crustacea, Brachyura, Ocypodidae) on the south-eastern coast of Brazil. Pan-American Journal of Aquatic Sciences, 3(3): 373-383. Download PDF file (190 Kb). Martins, S. E. & Bianchini, A. Copper accumulation and toxicity in the Plata pompano Trachinotus marginatus Cuvier 1832 (Teleostei, Carangidae). Pan-American Journal of Aquatic Sciences, 3(3): 384-390. Download PDF file (125 Kb).